Great classic rock…All their major hits! 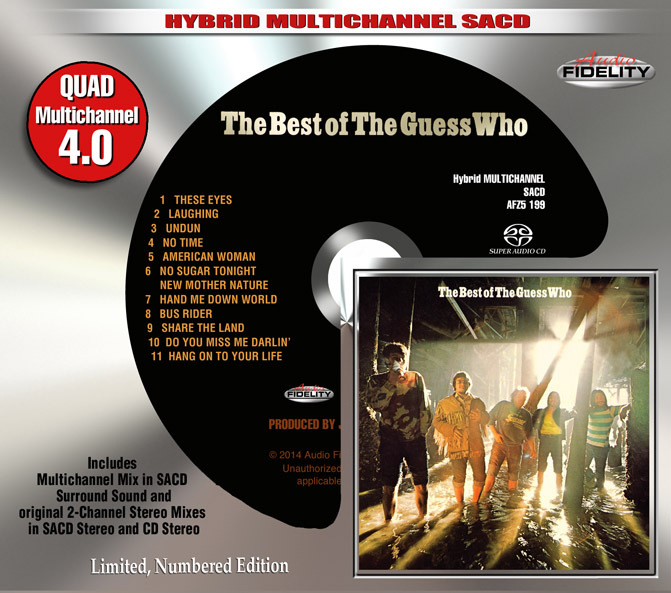 Camarillo, CA – Marshall Blonstein’s Audio Fidelity will be releasing The Guess Who’s “The Best Of Guess Who” album on Limited Edition 4.0 Quad Hybrid SACD in April 2015. They didn’t have street cred; they didn’t look like stars; and they weren’t considered “cool” by the ultra hip and snooty underground FM rock crowd. But over the course of their career, The Guess Who created some of the most transcendent and electrifying pop music of the Seventies. The Guess Who stubbornly flew in the face of fashion, trends, and the flourishing progressive rock movement, and built an enduring body of work that illuminates their status as immensely gifted pop rock practitioners. Though influenced by the British Invasion, The Guess Who were purely Canadian rockers. The band scored a string of Top Ten hits in the late ’60s and early ’70s, including the psychedelic-romantic smash “These Eyes” and the riff-rocking anthem “American Woman.” The band was a huge success in the States and even performed at President Nixon’s inaugural ball (with the acerbic “American Woman” conspicuously omitted from the set list). Burton Cummings’ throaty baritone vocals and guitarist Randy Bachman’s theatrical riffs gave the band their versatile sound – and their rocking classics sound as vital today as they did when they were first released. As a special bonus that audiophiles and fans alike are sure to enjoy, Audio Fidelity has included in each package a miniature version of the coveted psychedelic poster that was contained in the original 1971 vinyl album release! 10. Do You Miss Me Darlin’?